When it comes to running an online business there are two goals that must be fulfilled in order to be successful. The first is to get traffic to your website, and the second is to convert that traffic to sales. 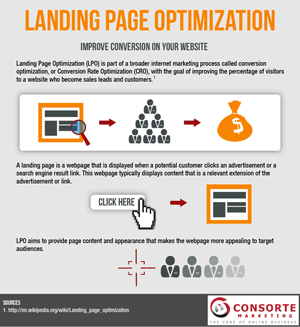 A key component of the second goal is to optimize your landing page. A landing page is the page that is displayed when a consumer clicks a link to your site from a search engine or other website. It may also be the page that a user lands on through the website navigation. Each of these pages should be designed with a specific goal in mind – compelling the user to press the “buy” button and add an item to the shopping cart, to write a review or to enter their credit card information and complete the checkout process. Unfortunately, many websites fall pretty to the belief that if a landing page looks “pretty” consumers will purchase their products. Moreover, it takes a focused use of search engine optimization to get the traffic you want to the correct landing page. 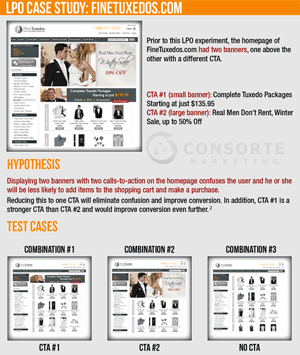 At Consorte Marketing our years of experience in ecommerce have taught us to utilize a scientific approach to optimize landing pages in order to maximize sales conversions. This approach combines industry knowledge with psychological research and multivariate testing (i.e. comparing the results of different versions of a webpage or design to obtain the most effective results). A proper landing page is designed to compel the user to perform a given action. One example would be for the user to press the buy-button and add an item to the shopping cart. In this scenario, button placement on the page would be important, as would the color of that button and the various options the user has in configuring their selection, navigating to a different product page or becoming a fan on Facebook. Another scenario would be discovering the balance between the amount of content on the page for SEO, minimizing confusion and establishing confidence in your website, brand and the fulfillment of an order once it is placed. Besides button placement and calls-to-action, there are certain psychological triggers that may cause a consumer to leave the page, or to be more likely to buy a product – for example, depending on your demographic, a green button might yield a higher click-thru rate than a red button, unless you happen to be in China where the color red is considered lucky. There is no hard and fast rule however; your specific industry, website color scheme and overall design are also determining factors. This is where multivariate testing – often referred to as A/B testing – comes into play. By comparing a control (i.e. your original design) to one or more challenger designs (i.e. modified versions of the same page), we are able to determine which will yield the most effective results. We’ll come up with various content experiments by presenting various iterations of the same page to different consumers at once, and we’ll track the results from each version to determine the most effective solution. We can begin our LPO journey using Google Experiments, a free tool that’s built into Google Analytics. As budget allows, and traffic justifies a more significant investment in LPO, 3rd-party software may also be considered. Amadesa,Vertser, Monetate, Offermatica, and Optimost are examples of LPO tools that are more robust than the free Google tool, and are good choices when a high ROI is anticipated. The bottom line? Consult with a professional landing page optimizer when you’re ready to get serious about your website.